Welcome to another weekly fashion post, where I share real fashion for real women. Each week, I highlight at least one outfit that I'm wearing right now, as well as provide ideas and inspiration to help you get dressed in the mornings. Life is hard, getting dressed shouldn't be. This week let's talk about a style powerhouse - the wrap dress. Last week, I attended a workshop and the presenter was wearing the most fabulous wrap dress. While it was a pretty pattern, it wasn't anything "special," but she looked pulled-together, polished and comfortable. The perfect outfit - right? Needless to say that after the presentation, I not only thanked her for all her valuable information, but also complimented her on her great dress. Then I went home and dug mine out of my closet. I've had this simple dress for a few years now. It's from Coldwater Creek. I paired it over my favorite SPANX Tight End tights and Brienne Tank from Aventrua Clothing. Since it's still cool here, I pulled on a pair of tall boots. The great thing about a wrap dress, is that it can be paired with almost any shoes. You can dress one up with a great pair of heels, dress it down with espadrilles or sandals, or my favorite for three seasons of the year, boots. The wrap dress, thanks to Diane Von Furstenberg, first hit the fashion scene in the mid 1970s. It symbolized power and independence to a generation of women, and within two years, she had sold more than a million of them. Wrap dresses are just as popular today, at least with women who know their power. It doesn't matter whether you are wearing a true wrap dress, or a faux wrap dress. 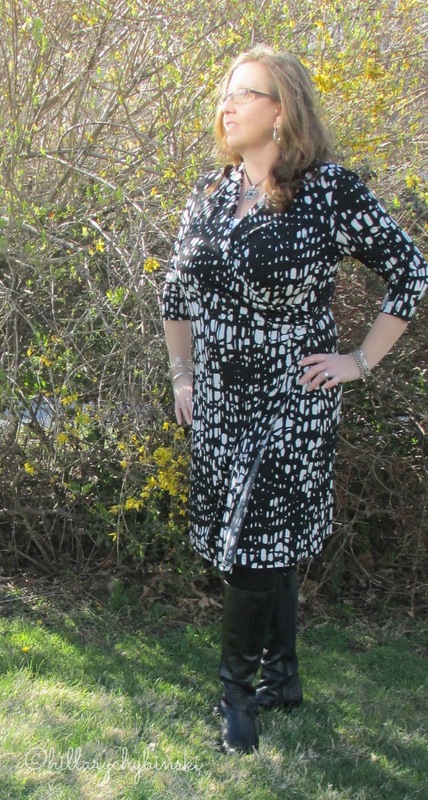 Wrap dresses work on almost every figure. Even pregnant women can wear a wrap dress. Not only does a wrap dress flatter most body shapes, it also comes in many price points so it fits almost every woman's budget. You can buy a wrap dress at H & M and at Neiman Marcus right now. If you get a bright color or print, keep your accessories simple and to a minimum. If you have a belly, consider a faux wrap dress that cinches off to one side, rather than a belted style. Consider adding a statement bag. If your dress is black or another neutral, go ahead and add a bold statement necklace. So next time you need a dress for an occasion, take a look at wrap dresses. 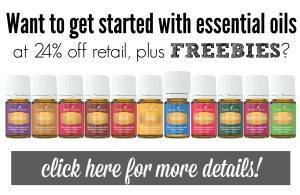 Try on a few to see what works for you. In no time, you will look stylish, pulled together and classically chic. Have you already discovered the power of the wrap dress? What's your favorite one? 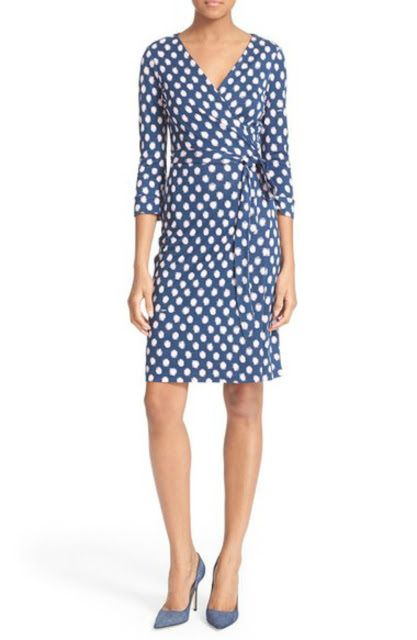 Love the DVF wrap dress. Welcome by. 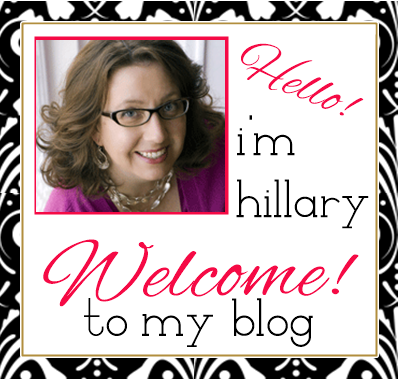 I started a linkup on Thursdays and I would love for you to join me tomorrow and every Thursday. Thanks Ada - I'll check it out! 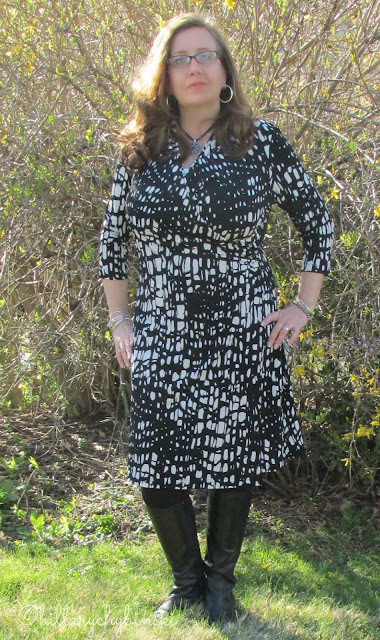 I love wrap dresses, and they're especially handy when your weight goes up and down over the years. I find a lot of nice ones at Lands End. Oh you know I'm a huge Lands End fan! And yes - they are forgiving and flattering for sure!! I've had my eye on the DVF wrap dress, and I see that it's on sale now!! You look fab, BTW!! Thanks for keeping it real. It looks great and quite comfy.